"Somewhere a forest fire blazed." Mr. Popper arrived shortly after two o'clock on Friday afternoon, and we promptly left Blue Lake. Throughout the weekend I would contend that his tardy arrival precipitated a crescendo of increasing anomaly, like fluttering wings of an African butterfly might trigger a New World hurricane, culminating in our abysmally late return home on Tuesday night. Mr. Popper, of course, swore he had arrived much earlier, though his punctuality was never satisfactorily resolved. We stopped for sandwiches at a new coffee shop in Weaverville, then drove up Highway 3 to the Scott Mountain summit campground, where we decided to spend the night. At least five fine campsites presented themselves, with no one around and only one vehicle. We never saw the owner. The next morning we awoke to loud jabbering and rock music emanating from the parking area just off the highway at the summit. A group of maybe twenty teens on their way home from camp had managed to spend the night without injuring themselves or us. After breakfast we drove to Callahan, took the Cecilville Road west, then turned south on Caribou Road (FR 37N24) up the South Fork of the Salmon River to the China Gulch trailhead. This was the shortcut into Grizzly Lake. The traditional, long approach is from Hobo Gulch trailhead, following the North Fork of the Trinity River north to Grizzly Creek, thence east for a total one-way hike of 19 miles and more than four thousand feet elevation gain. Our route, up and over the ridge from the north, spanned no more than 7 miles, although our total elevation gain would be about 3800 feet. We began our hike, as usual, in the heat of the day. Fire restrictions were in effect, but we did not pack a stove. With our backpacks hoisted and strapped on, Barbara spotted a clear fluid dripping from a detached hose beneath the van's engine. The smell of gasoline was strong. We debated whether it signified a proper function of the vapor recovery system or a punctured fuel line. There did not appear much that we could do about it without spoiling our hike, so we headed out hoping things would be better when we returned. 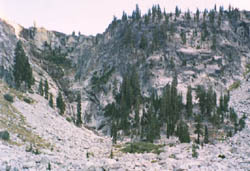 Fortunately, logging had extended the access road all the way to the wilderness boundary, which reduced by 400 feet the elevation gain up to Hunter's Camp on the Salmon Divide. But carrying our packs up the steep 1200 feet of maddening switchbacks on a hot August afternoon quickly sapped our strength. By late summer, Hunter's Camp offered neither hunters nor a camp, but only a parched opening in the brittle dry fir forest thirsting for the cold blanket of winter snows. Even the yellow jackets seemed edgy. Hunter's Camp is a place to squat on a downed log, catch one's breath, and watch that the carpenter ants don't crawl into your pants. Hunter's Camp is nothing but a waterless clearing on the backbone of the east-west ridge dividing the Salmon River drainage from the Trinity River drainage. 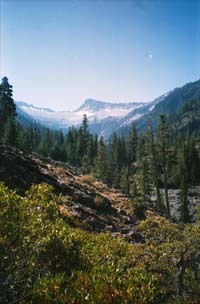 From there the ridge arcs east and south, rising to the peaks surrounding Thompson, the highest real estate in the Trinity Alps. In theory, if one person pissed north off the ridge into China Gulch and another south down the canyon into Grizzly Creek, the droplets would unite in the Klamath River somewhere near Weitchpec. From Hunter's Camp we entered deep forest and started down the more gentle south slope past gulches carved by gathering tributaries of Grizzly Creek. After a while we broke out of the trees above chaparral and beheld a spectacular view southeast to Thompson peak and a snow-pocked glacial cirque above Grizzly Lake. The air was clear, the sky a cloudless blue, and the polished granite curled beneath Thompson's black spire like a white stone grin. Entering the dense chaparral, we finished descending 1400 blind, hot, steep, and breezeless feet to the Grizzly Creek trail. By the time we reached the junction, we were already exhausted, and Mr. Popper was suffering pain in his left knee. Resting briefly, we considered staying at a large campsite with great fallen logs near the junction. We could hear, but not see, the creek gurgling enticingly in an alder thicket a hundred feet down the slope. When we had recuperated a bit, however, we decided to make another mile or two before evening fell. The next campsites were supposed to be one mile up the trail. That turned out to be a very long mile, and happiness was finally rounding a curve into the canyon with Grizzly Creek cascading alongside the trail. Campsites abounded. We had the choice of a beautiful site carved in the metasedimentary bedrock right beside the creek or a few more up along the exposed rocky slope. Barbara found a more secluded site between Douglas furs and a sheer rock wall. 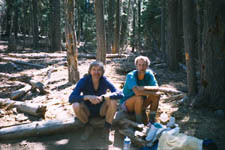 As we cooked and ate our dinner, three groups passed through our camp hiking out. On Sunday we hiked two or three miles to Grizzly Meadow at the foot of a storybook waterfall. Beyond the meadow, the trail entered the jumble of granite boulders scattered at the base of the cliff. The fall of water splattered into the boulders, disappeared, then reemerged hundreds of feet further down as Grizzly Creek. We set up camp in a large clearing in a stand of mixed conifers across the creek and well away from the trail. The site had the look and smell of a horse camp, but there were good trees for hammocks and two level tent sites. We stayed there for two nights. From our hammocks the fabled waterfall appeared a bit feeble and disappointing. The evening was warm and dry, with no hint of rain clouds. Campfire restrictions were in effect due to the early fire season, but since there was no wind, we decided to scratch out a fire ring and build a very small cooking fire anyway. We figured that the little ranger wouldn't know and the Big Ranger wouldn't care. That night Barbara awoke and sat up in the tent imagining she saw the woods ablaze all around us. When she came fully awake, she could see there was no fire, but later that night she dreamed of an explosion. She then dreamed of her mother recovering from surgery in Illinois. On Monday we day-hiked up to Grizzly Lake. The trail through the boulder field at the base of the waterfall was surprisingly good until it button-hooked left to the blind face of the cliff. 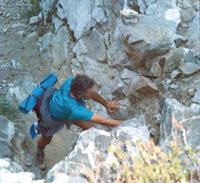 A few places with loose rocks and scree and one or two chutes were particularly difficult to negotiate, requiring both hands and feet, like scrambling up a crumbling ladder. I wondered how I had ever carried a backpack up this wall on my first solo visit years before. We scrabbled up 800 feet to a bench above the top of the waterfall, which grew more robust as we approached. 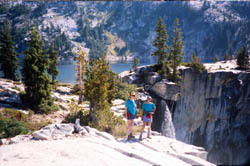 At 7100 feet, Grizzly Lake lay sprawled between the stark north face of 9000-foot Thompson Peak and the granitic abyss into which the water tumbled. To cross the outlet just above the waterfall, we had to climb down sharp-edged granite blocks, step across the narrow stream, then scramble up over the stone monoliths on the other side. Like lizards we slithered on our bellies to ogle over the edge at the stream tumbling down the sheer cliff. As we lay there, the last group of Czech campers began their long hike out, leaving the lake entirely to us for the day. Down the canyon to the south we could see in the distance a thick haze blanketing the valley. Somewhere a forest fire blazed, but we couldn't tell how close. We wondered if perhaps the van had exploded, as portended by Barbara's dream. We would have to wait another day to find out. To the south remnants of the glacier hunkered in cold pockets below Thompson Peak, victims of the drought. Another waterfall from the snowmelt cascaded down into the lake, giving life to a scattering of sparse trees clinging to the fractured rocks with twisted roots. We hiked around and checked out the empty campsites, mostly barren, exposed flats scratched out on the granite, then went swimming before and again after lunch. The water was not so cold on the legs when standing knee deep, but swimming for more than a minute was difficult. The lake bottom lies some 170 feet below the black, calm surface. On the granite edge above the precipice, Barbara's camera caught me exposing myself fully to nature. We waited for the sun to strike a rainbow in the waterfall before we tore ourselves away for the precarious hike back down to the meadow. Tuesday we were up early and on the trail by 9:30, but it was past noon by the time we began our steep uphill climb to Hunter's Camp, in the heat of the sun, as usual. The trail was not so completely exposed as we had remembered, but the heat was unbearable. We were soaked with sweat by the time we rested at Hunter's Camp. The last part was all downhill and in shade, but Mr. Popper's knee was bothering him again. In a motivational discourse, I assured him that he had better keep up on his own, because if he did not, we would by god leave him there to die and be eaten by weasels. We all arrived at the trailhead an hour later. There was no sign of a forest fire. The van was intact, started easily, and carried us safely back to civilization. Night had fallen by the time we arrived home.